The Mexican artist Frida Kahlo, known for her dynamic self portraits, was essentially her own muse. Her work, almost totally autobiographical, has made her one of the most influential artists of her century, associated with Feminism and inspiring women artists worldwide. Her face has become iconic and is one of history’s most recognisable. Her distinctive, intense beauty and powerful life story have allowed wonderful opportunities for me to create a Frida art muse. 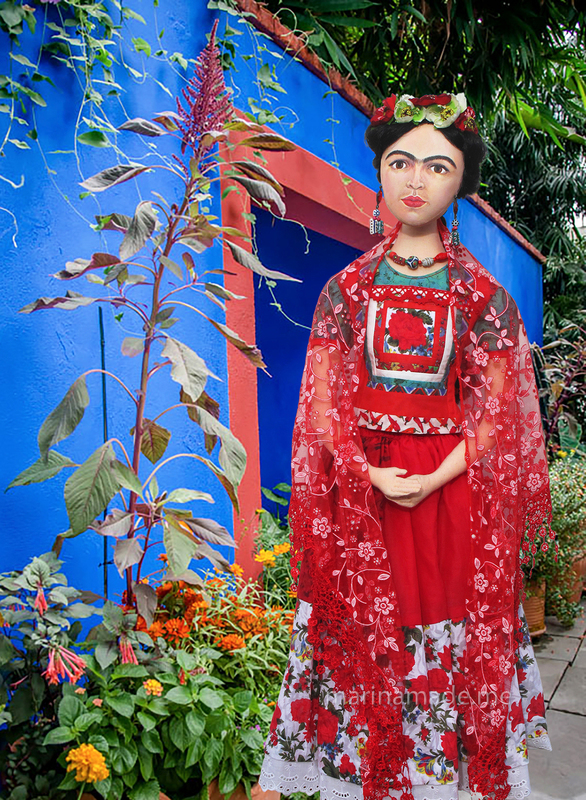 Muse of Frida Kahlo in the garden of the Casa Azul, wearing a Tehuana dress. Frida Kahlo seated in front of a blue wall outside the Casa Azul. Frida with Cacti in her garden. 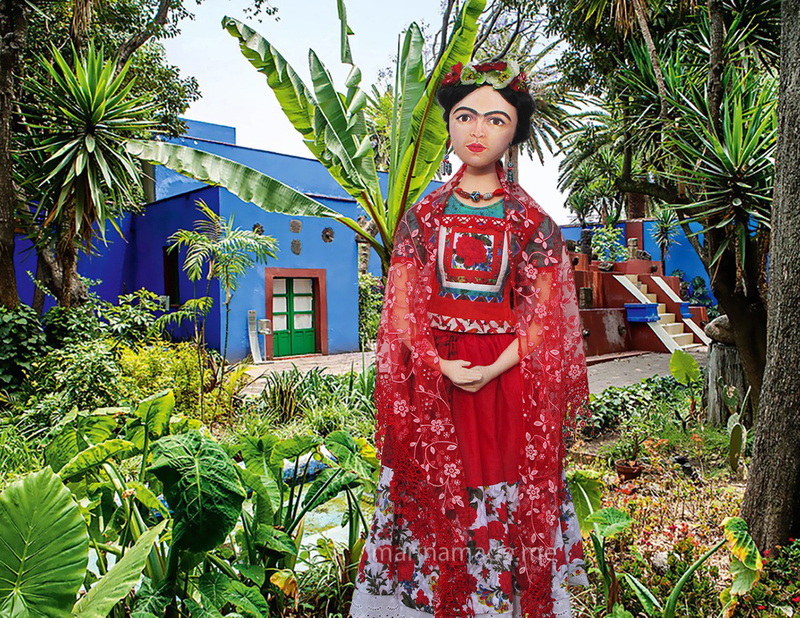 Frida in her garden at the Casa Azul wearing a Tehuana style dress. 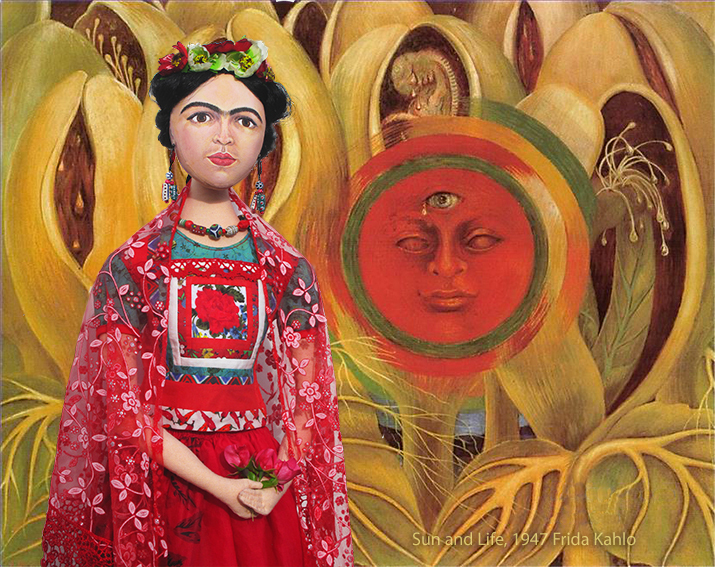 Frida muse with “The Love Embrace of the Universe, the Earth, Myself, Diego and Senor Xolot”. Detail of painted corset on Frida muse, a copy of one of Frida Kahlo’s hand painted plaster corsets that she regularly wore. Frida Kahlo was born on July 6, 1907, in Coyoacán, a town on the outskirts of Mexico City. 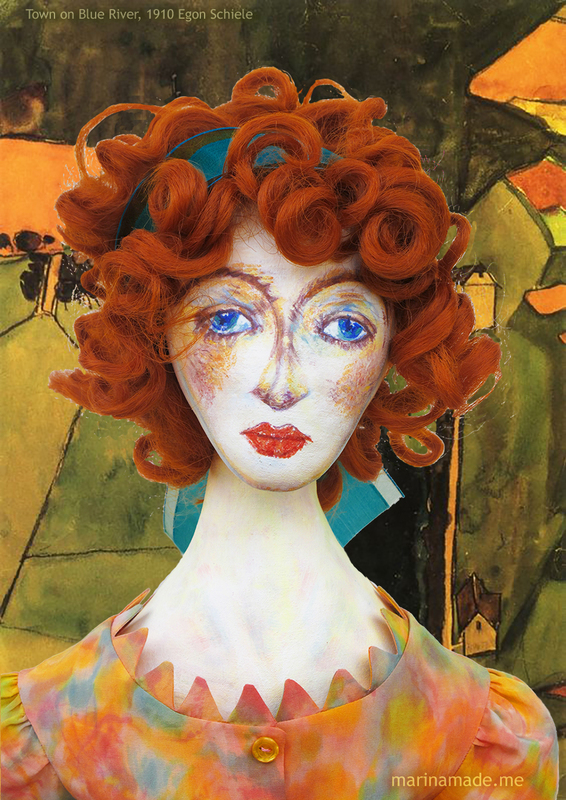 Her father, Wilhelm Kahlo, was German and had moved to Mexico at a young age. Frida’s mother, Matilde Calderon y Gonzalez, born of mixed Spanish and Indian ancestry, was Wilhelm’s second wife, and raised Frida and her three sisters (a fourth sister died shortly after birth) in a strict and religious household. It is believed that Frida suffered from polio when she was six years old, although the exact circumstances of her illness are uncertain, as it is also thought that she may have had a tumour; however her illness kept her bed bound for nine months and left her with a withered leg and a limp. Frida’s father, Wilhelm,(also known as Guillermo) was adamant his daughter would thrive and enrolled his daughter at the German College in Mexico City, introducing her to the writings of European writers and philosophers. 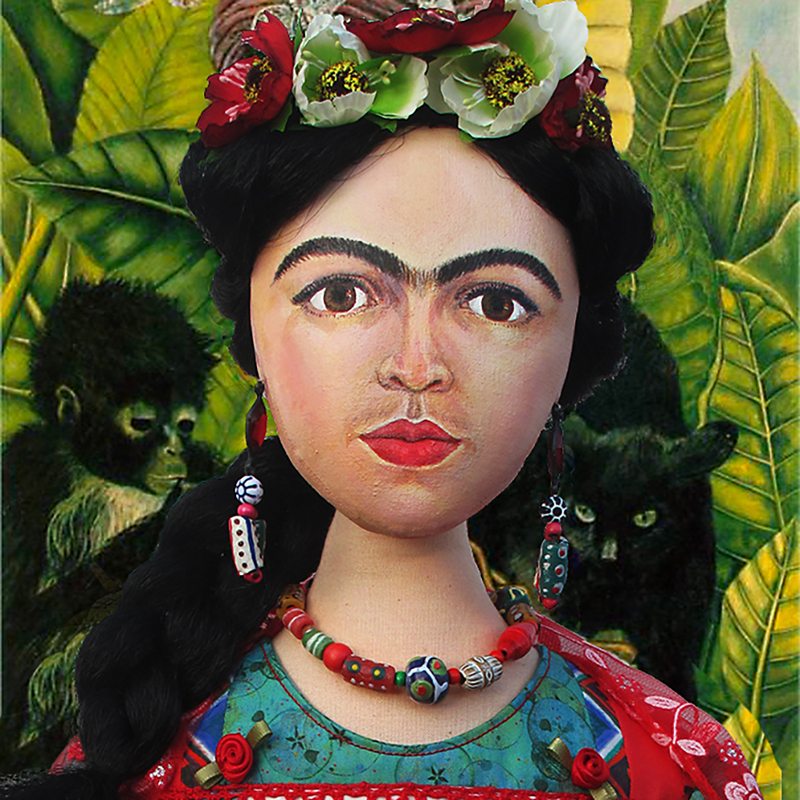 Frida’s mixed European and Mexican heritage permanently affected her approach to her life and artwork. An early photograph taken by Guillermo Kahlo of his wife Matilde and their daughters, Cristina, Adriana and Frida. A beautiful young Frida, 1931. Photographer unknown. In 1925 Frida was severely injured in a near fatal bus crash. Aged 18, while travelling home from school with her boyfriend, their bus was hit by a streetcar. A metal handrail pierced her abdomen and womb, smashing through her pelvis and exiting on the other side. Frida was seriously hurt, her injuries included: a broken spine, ribs, collarbone, left shoulder and right leg. Frida Kahlo’s life was changed forever. The accident was to define her life and her art. 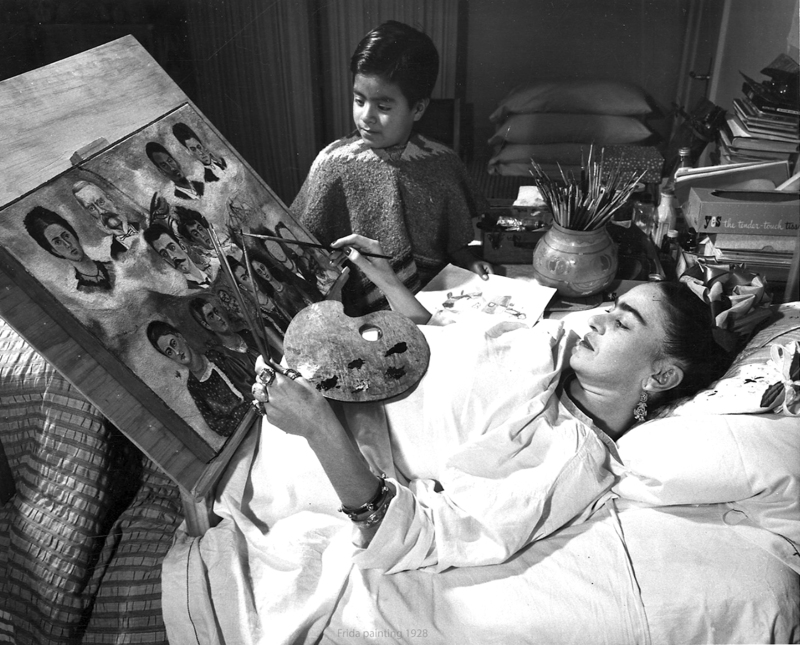 Frida painting on a special easel rigged up so she could paint while lying in bed convalescing. 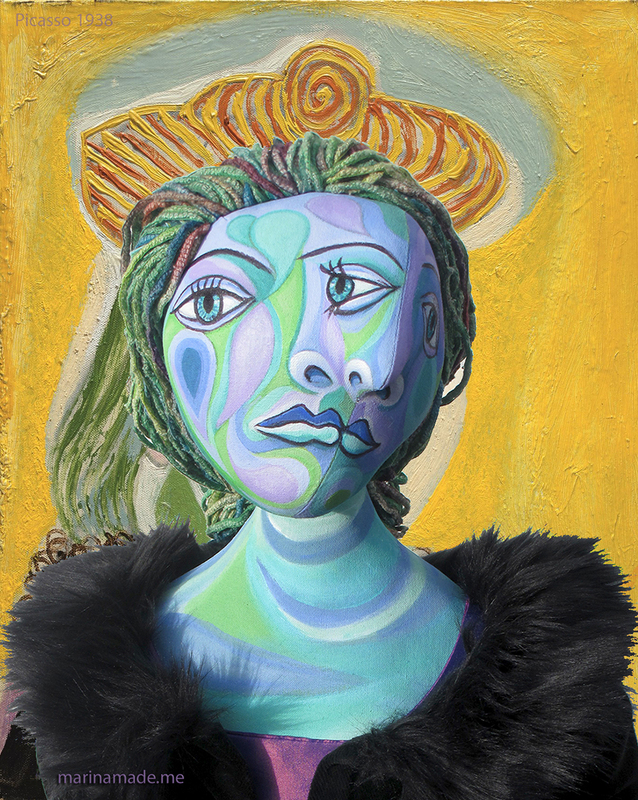 Painting became a way to communicate her pain, both physical and emotional, as well as her joy. Her ‘self’ was to become the subject that dominated her artistic output. It is in her iconic self portraits, unequalled in their poignant beauty, that Kahlo depicts both her isolation and also her unbeatable spirit and sense of self. Self Portrait in a Velvet Dress, 1926, an early work by Frida Kahlo. Time Flies, an early self portrait by Frida Kahlo. Self Portrait with Monkey, Frida Kahlo. In 1927 Frida met and fell in love with the renowned Mexican muralist Diego Rivera. Frida had been acquainted with him before her accident, at Escuela Nacional Preparatoria when he was painting the “Creation” mural in her school’s auditorium. Frida aged 20 watching Diego Rivera at work on the Creation mural at Escuela Nacional Preparatoria. Frida and Diego in 1929, the year they married. Photographed by Tina Modotti. Kahlo began to familiarise herself with the artistic and Communist circles in Mexico City and joined the Communist party. Both Frida and Diego were active members of Mexico’s Communist Party, and played a direct role in the struggle against the Americanisation of Mexico. In August 1929, aged twenty-two Frida married Diego, it was his third marriage and he was twenty years her senior..
Kahlo’s parents described the union as a “marriage between an elephant and a dove”, referring to the couple’s differences in appearance. He was over six feet tall and weighed around 22 stone (136 kg), while she was 5’3″ and 7 stone,(44.5 kg). Her mother was against the marriage, but her father approved of it because Rivera would be able to pay for Kahlo’s continuing medical expenses. Diego and Frida in San Fransisco, a year after they married in 1930. Diego Rivera and Frida Kahlo at work in the USA. Frida and Diego in San Fransisco, a year after they married in 1930. Kahlo said that there were two accidents in her life, the second was her tempestuous relationship with Mexican muralist Diego Rivera. Throughout the 1930s, life in Mexico was tense for Frida Kahlo: Rivera was an unfaithful husband and the revolutionary climate leading up to the outbreak of the Spanish Civil War made for an explosive atmosphere. In their early years together, Kahlo often followed Diego based on where the commissions that he received were, this included San Francisco and Detroit in the USA. Married life was not easy, she suffered two failed pregnancies and a further miscarriage after Diego had an affair with her younger sister, Cristina. During the rise of fascism in Europe in early 1930s, Kahlo’s interest in distancing herself from her Germanic roots is evident in her change of name from Frieda to Frida. 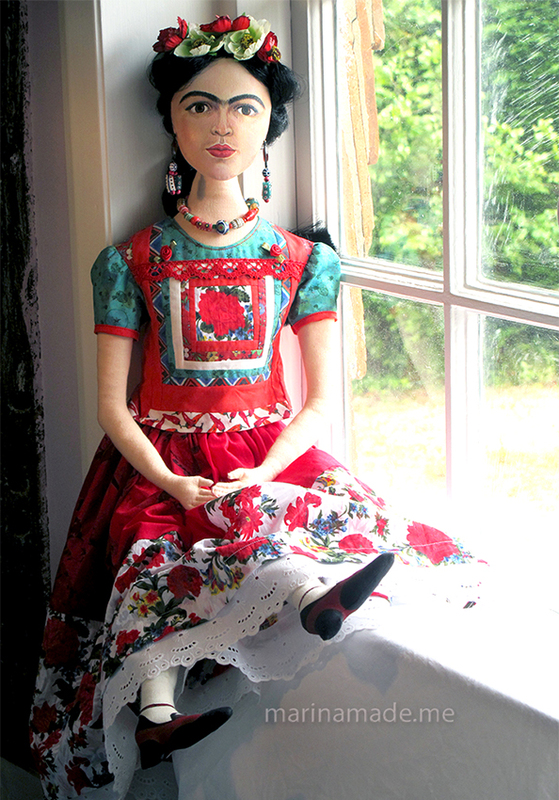 Frida muse with her “self portrait along the border between Mexico and the USA”. 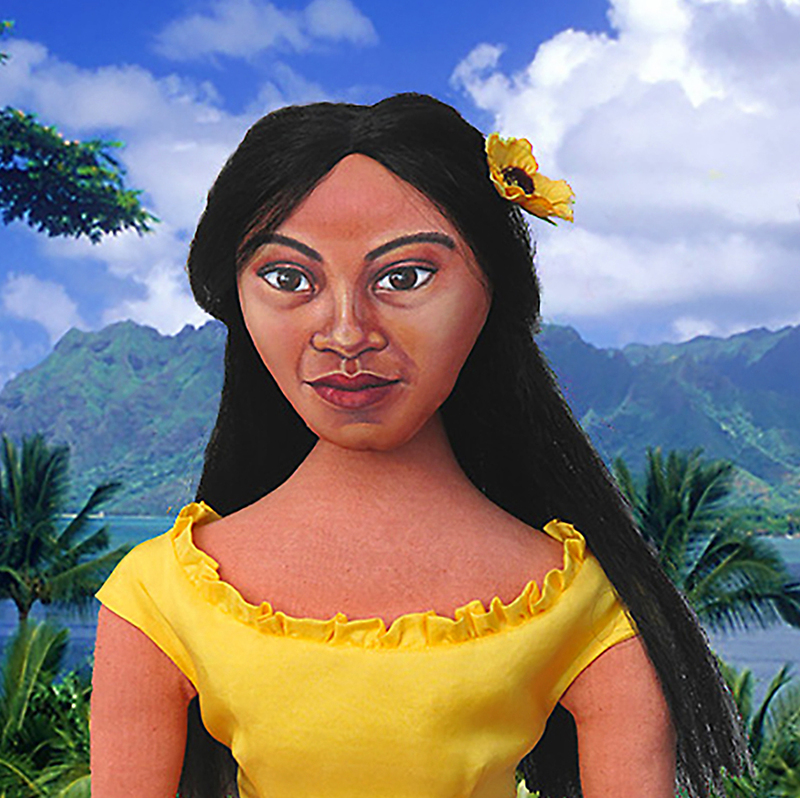 Kahlo is wearing a traditional Tehuana dress. 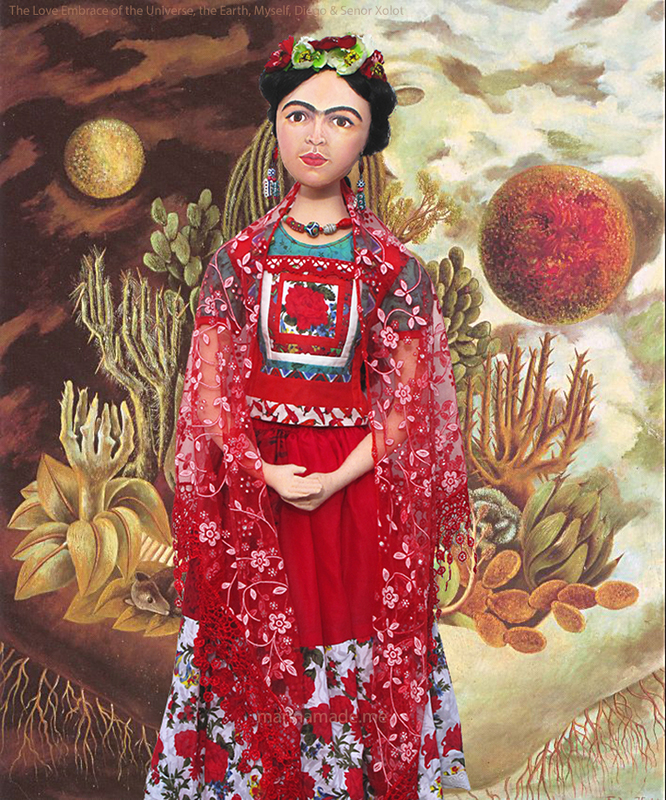 At this time Kahlo’s painting evolved to include a more assertive sense of Mexican identity. The hybrid Indian-Spanish origins of her mother became an important source of inspiration to Frida. She took to wearing Tehuana dresses from the southeast Mexican state of Oaxaca, home to her mother’s family. Oaxaca was a rare matriarchal society within a largely patriarchal country. 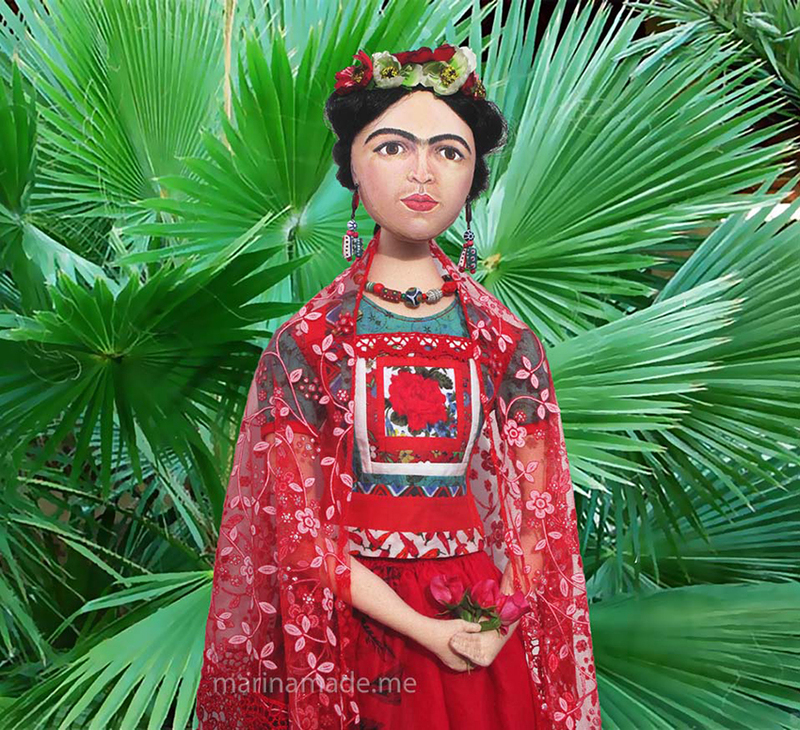 To Frida, its costume was a symbol of female power. She also favoured this indigenous style of dress because the long skirts and blouses helped cover her misshapen leg and the corsets she was forced to wear. But most importantly, she wore her magnificent dresses because both she and Diego recognised them as emblems of national pride. A photograph of Frida’s maternal family wearing Tehuana style clothing. Frida’s mother, Matilde Calderon is circled on this 1890 photograph. Self Portrait by Frida Kahlo, 1948, showing the artist wearing traditional Tehuantepec costume. Frida’s dresses in the Tehuantepec style in an exhibition in Mexico City. Indigenous dress formed a big part of Frida’s persona, together with her elaborately garlanded hair and jewellery. By early 1933 when the couple was living in the USA, Frida had polished that persona. She was referred to in several articles, including in Vanity Fair, Time and Vogue, as ‘Diego Rivera’s beautiful young wife’, Frida’s exotic looks made quite an impact in America. 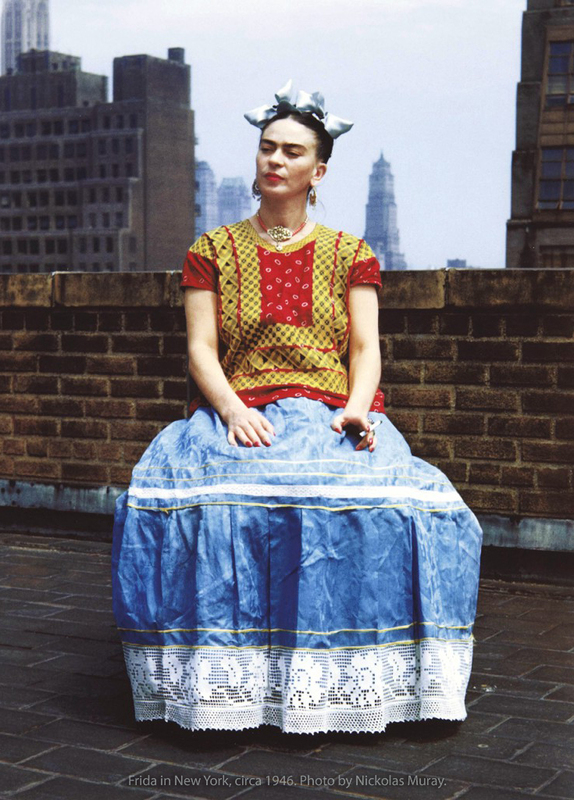 Frida in New york 1946, wearing her colourful Tehuana style influenced dresses. Over twenty-two years Frida produced a relatively small yet consistent and impressive body of work. Kahlo portrayed herself over and over again in meticulous paintings, simultaneously exploring, questioning, and staging herself and her identity; be it as a woman, as a revolutionary, a disabled person, a wife, a lover, or a Mexican. Self Portrait, Frida Kahlo 1940. Self portrait with loose hair, 1947. Self portrait dedicated to Marte R Gomez 1946, pencil on paper, Frida Kahlo. Such personal subject matter, along with the intimate scale of her paintings, sharply contrasted with the work of her acclaimed contemporaries, the Mexican Muralists. Frida’s intimate paintings didn’t fit into any one artistic style, certainly not the grandly nationalistic Mexican modernism led by Diego. While Diego focussed on painting the serious matters of the wider world, Frida chronicled the state of their marriage, their affairs, and her physical and emotional pain in her paintings. 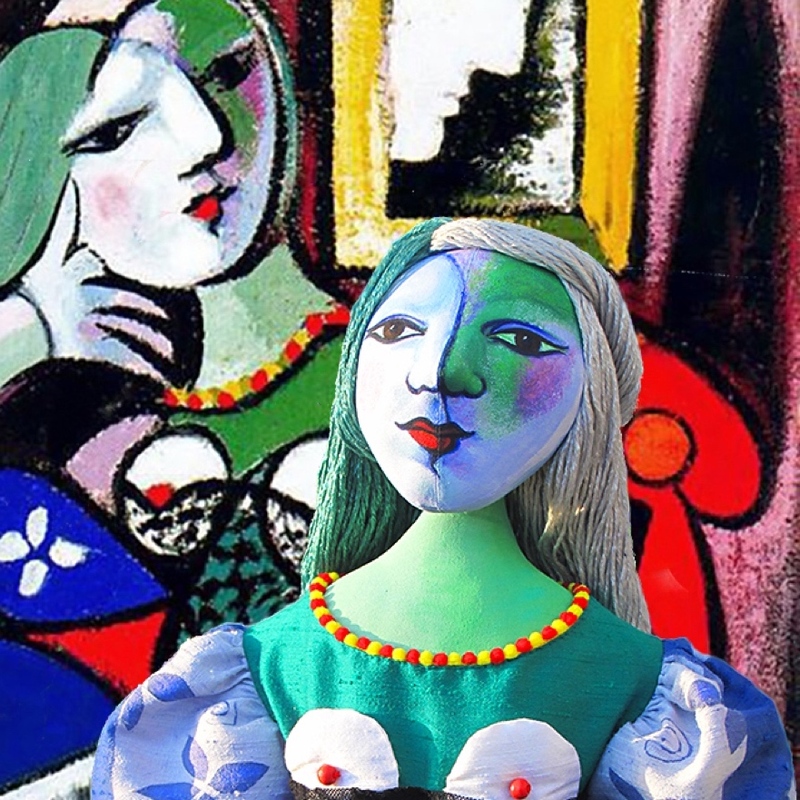 In 1938 she had a major exhibition at a New York City gallery, selling about half of the 25 paintings shown there. Kahlo also received two commissions, one was to paint a portrait of actress Dorothy Hale, who had committed suicide earlier that year by jumping from a high-rise building. The painting was intended as a gift for Hale’s grieving mother. 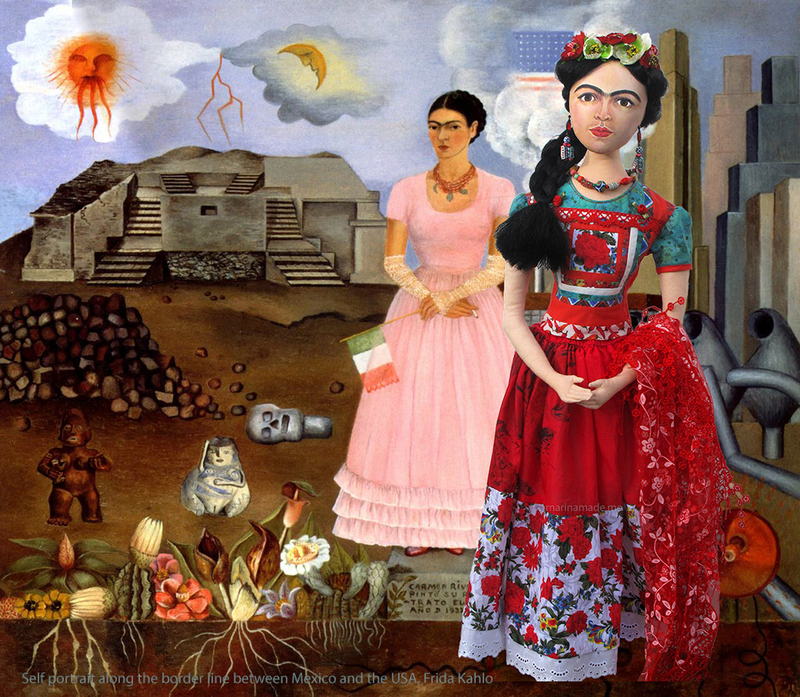 Rather than a traditional portrait, however, Kahlo painted the story of Hale’s tragic leap. While the work,’ The Suicide of Dorothy Hale’ (1939), has been heralded by critics, its patron was horrified at the finished painting. The Suicide of Dorothy Hale, Frida Kahlo 1938. Las Dos Fridas 1939. 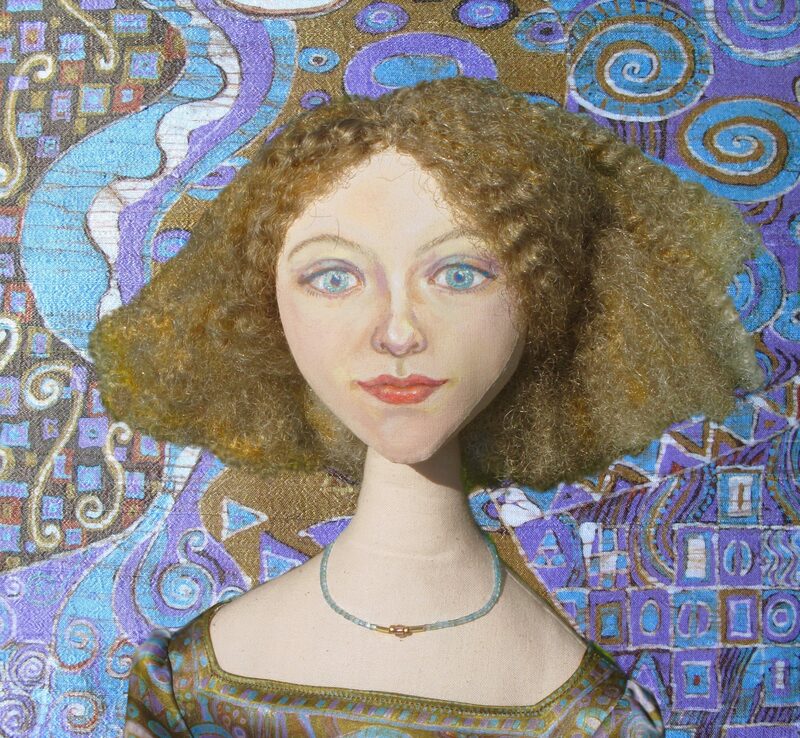 This portrait shows Frida’s two different personalities. 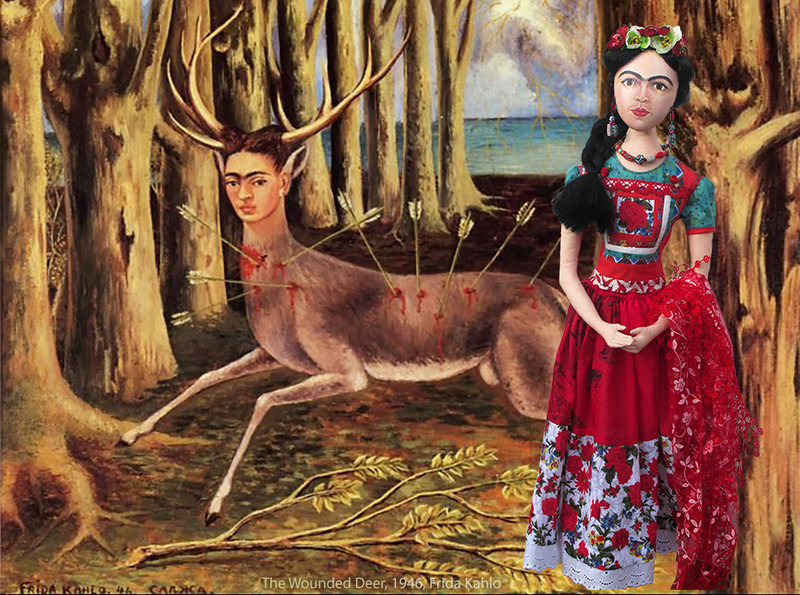 One is the traditional Frida in Tehuana costume, with a broken heart, sitting next to an independent, modern dressed Frida. Over time the ‘reality’ of her intensely subjective images revealed itself to be a kind of politics of the personal, and a new model in self-portraiture. 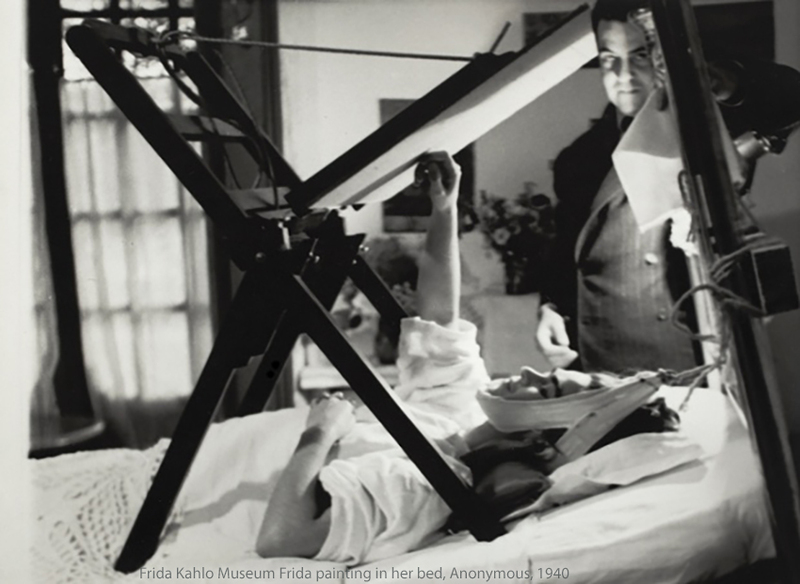 In 1950, Kahlo was again hospitalised for nine months at the English Hospital in Mexico. Kahlo continued to paint in her final years while also maintaining her political activism. 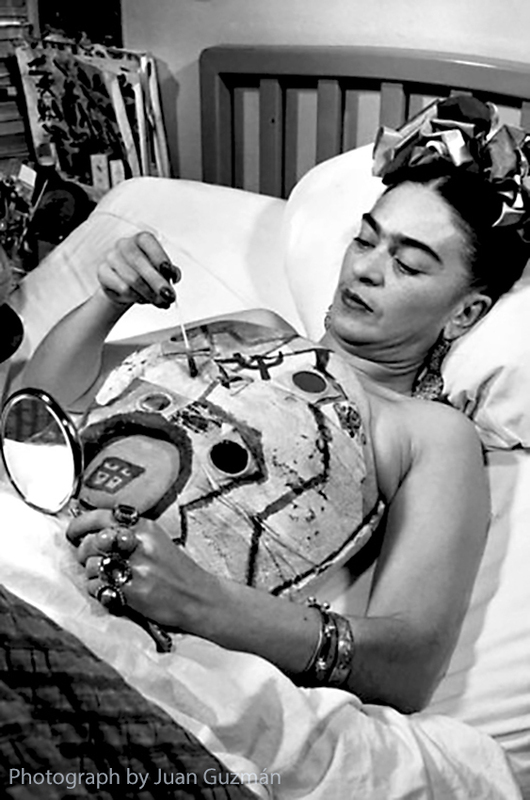 Frida painting her plaster corset while convalescing in a hospital bed. In 1952, Frida started painting still life; some consider to be a kind of indirect self-portraiture, paintings that continued to reflect her internal reality. It is possible that Frida didn’t want to keep painting herself as she aged, no longer seeing herself as beautiful. In a comment to her last lover Josep Bartolí, she said, “I paint flowers so they will not die”. In 1953 Frida Kahlo exhibited one last time in Mexico at Lola Alvarez Bravo’s gallery, it was the artist’s first solo show in Mexico. She was brought to the event in an ambulance and had her four-poster bed placed at the centre of the gallery. Kahlo’s delight was dampened a few months later when part of her right leg was amputated to stop the spread of gangrene. “Viva La Vida”, Frida Kahlo 1954, Frida’s last painting, she died a week later. Despite her physical ailments, a life of chronic pain and surgery, Kahlo’s talents as a painter were irrepressible. 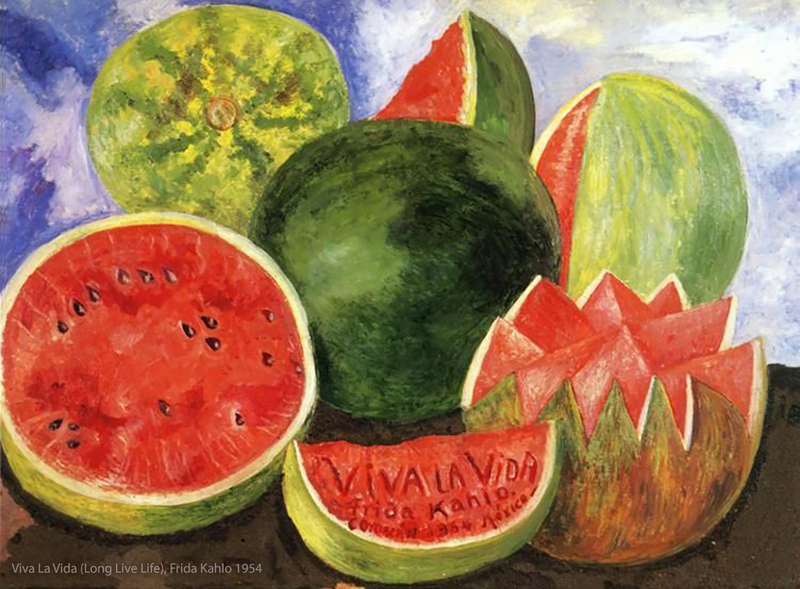 A week before she died, Frida painted the words ‘Viva La Vida (Long Live Life)’ on a scroll at the bottom of a painting of ripe watermelons, full of colour and life. In her last entry, she wrote in her diary: “I hope the exit is joyful, and I hope never to return. 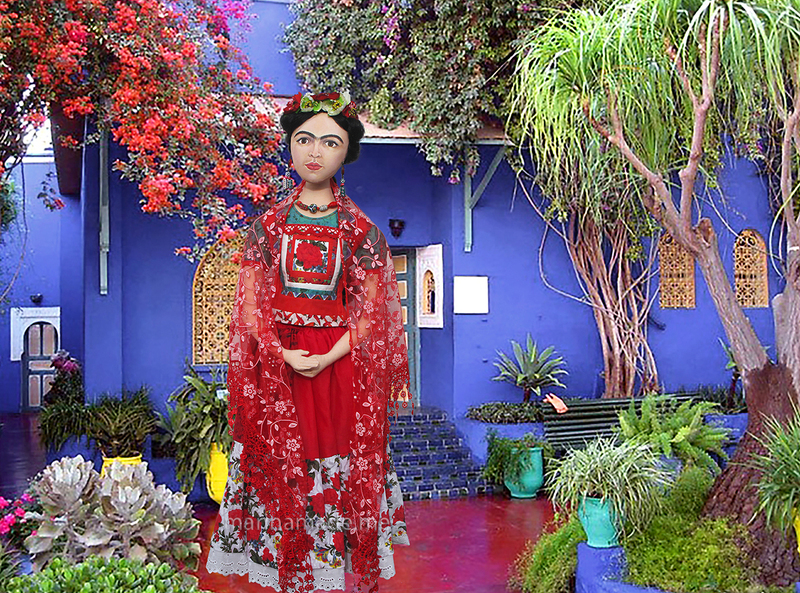 Frida” Kahlo died on July 13, 1954 at Casa Azul, her beloved Blue House, which is today the Frida Kahlo Museum. Though a pulmonary embolism was the official reason given for her death, it has long been thought she may have overdosed on the painkillers to which she’d been addicted for some time. 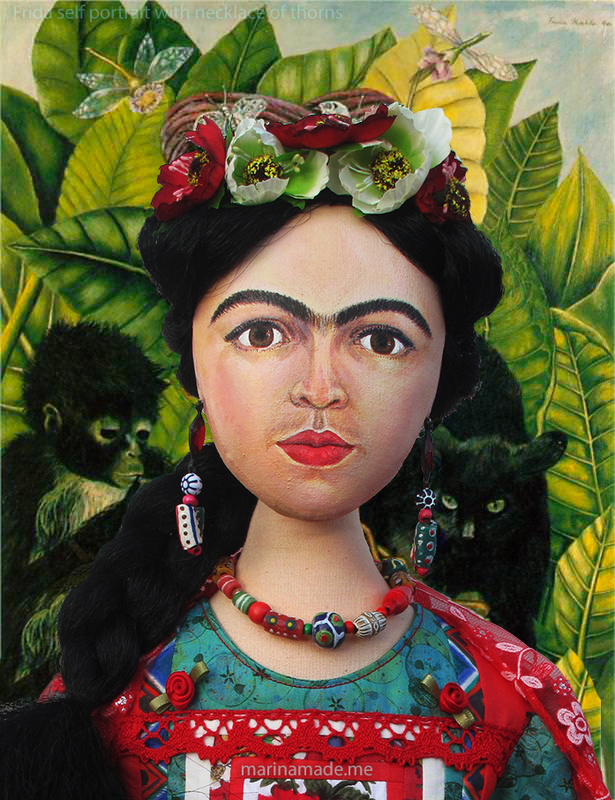 There have been stories about a possible suicide, If so Frida may have taken control of her identity to the very end. News photograph of Frida’s funeral. 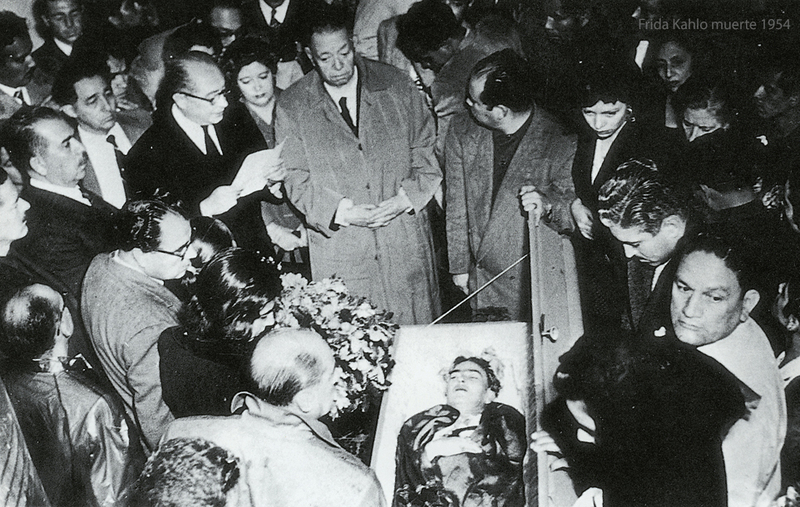 On the evening of July 13, Kahlo’s body was taken to the Palacio de Bellas Artes, where it laid in state under a Communist flag. The next day six hundred mourners filed past her coffin to pay their last respects. She was cremated later that day and placed in a Pre-Columbian urn which remains at the Blue House. Diego Rivera, who stated that her death was “the most tragic day of my life”, died three years later in 1957. 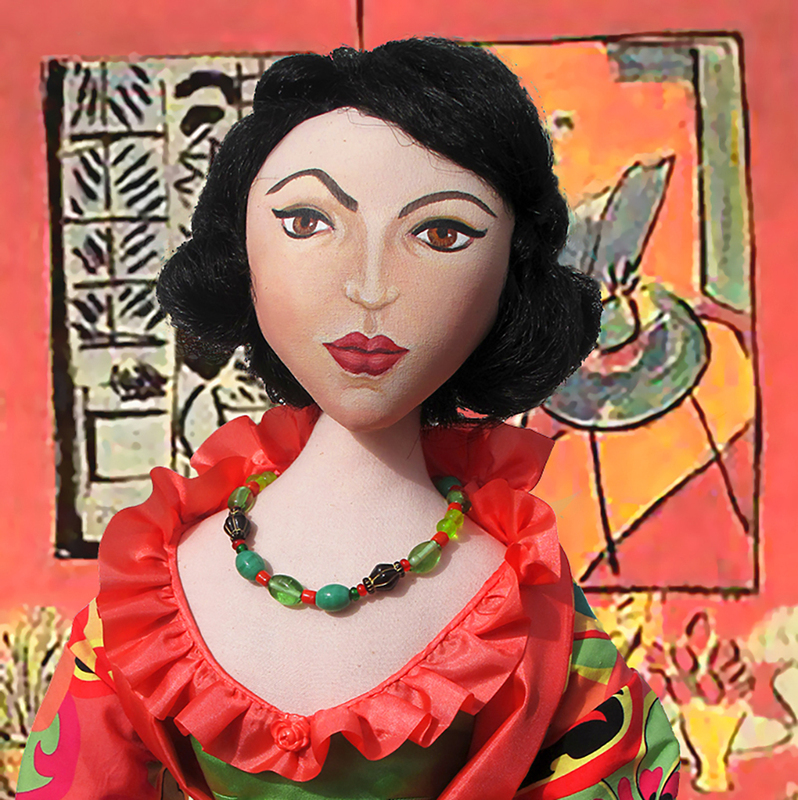 Frida Kahlo, in her own words,” I am my own muse, I am the subject I know best.” Marina’s Frida Kahlo muse pays homage to her work and life as an artist and 20th century icon. 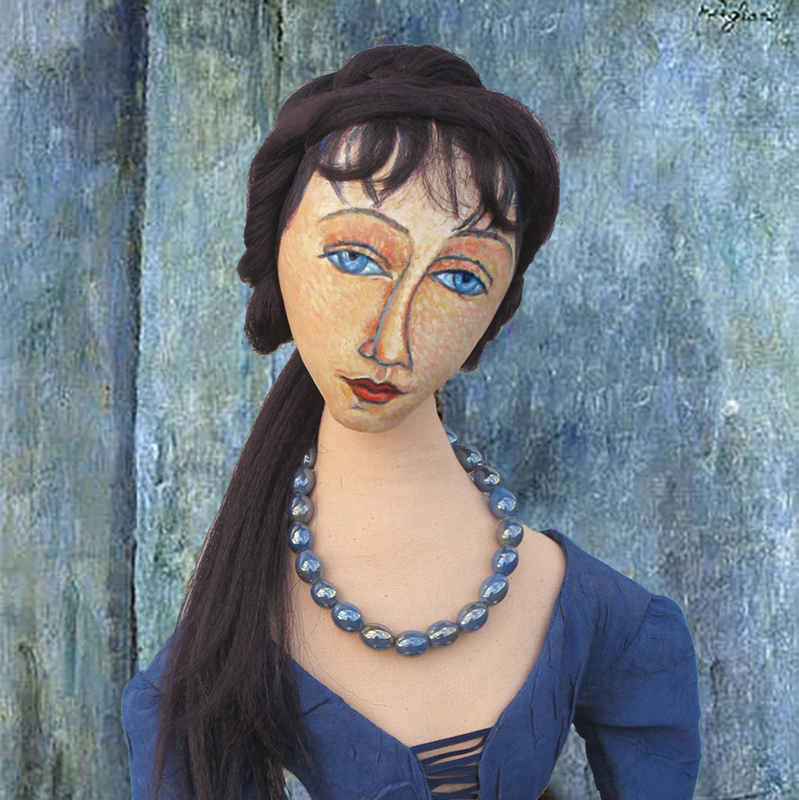 Frida is re-interpreted in soft sculpted form. I do admire the constant outflow of ideas in what ever medium you choose. Well done Marina. What an utterly striking image ! 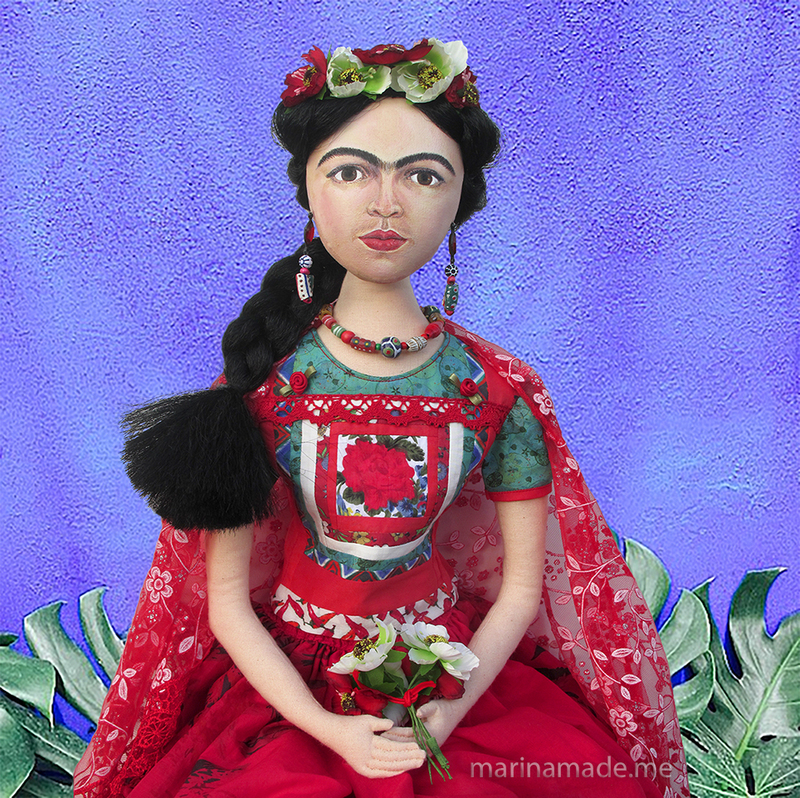 Perhaps the dark colouring of Frida goes some way to making this model even more beautiful than the others ?